Don’t we all wish we had the answer to that question? Most of us should get A’s for effort. We try. We try to help others heal their heart. We share their grief, sadness, disappointment, sorrow, fear. We offer comfort and support. We help hold them up and together. And HOPEfully we have people who will do the same for us. We should get A’s for effort for trying to heal our own heart. HOPEfully we keep moving forward. We should get A’s for the effort because our efforts help. However, they do not heal. They do not heal because only our Creator has the tools and material to heal what he has created. Our message today reminds us to let go and let God. 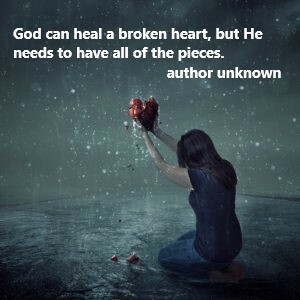 Only he can heal a heart that is broken. -God can and will heal me when I give him all of the pieces. -Lots of gifts that I had ordered arrived.